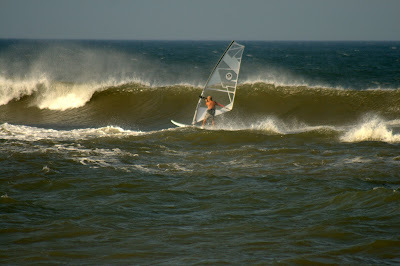 Bill's OBX Beach Life: Rmp 30 the OBX Magic Surf Spot This Summer?! I read all the surf reports ranging from OBX Surf Info to Surfline and most report poor/marginal conditions from the east facing north beaches to Buxton. Photos from the reports show minimal surf conditions and nothing looks too enticing. I have verified these reports by checking numerous spots along the east facing beaches ranging from Jennette's Pier to Lifeguard Beach and have confirmed that the surf is relatively small and weak at basically all spots. Occasionally, there is a decent break, but it remains on the small size compared to, wait for it.........Rmp 30! All in all, where all other OBX surf breaks now appears flat or minimal, Rmp 30 seems to fire. Perhaps the magic is its location relative to the orientation of Hatteras Island and the effect of wrap swell crossing Diamond Shoals. Points north simply do not get much of the wrap as the swell is minor and only driven by the Bermuda High SW winds (no E/SE energy driving the swell, but rather SW energy). Points south are too close to Diamond Shoals where much of the wrap is dissipated as it rolls over the shoals (thus Lifeguard Beach, Old Lighthouse, etc... are very short period and weak). yeah it sure is funny to read on the surfline report for the east facing beaches "ankle to knee high" and then go to ramp 30 and its solid chest or higher.